We offer amazing Branding Service to your business. Get mesmerized your online presence! We collaborate with aspiring brands and people; we’d love to build something great together. 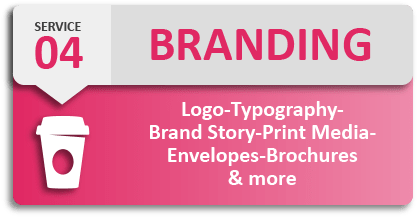 Our branding service will take your brand to the next level. We help you determine the strength of your brand together with its instabilities and opportunities for improvement and new developments. We give you a long-term plan for the development of a successful brand in order to achieve your business goals. We build the components of the brand (logo, name, tagline, tone, typeface) that are created by the business to reflect the value of the company. Our team helps you from conceptualizing to layout design, with designing of the highest level, courtesy our expertise in the domain. We Give you annual report to make an impact, you need a great annual report design, which our creative team does. Our dedicated team and access to integrated publishing systems while the client retains full ownership and editorial control. Whenever you brand a product, it is very important to get the right look and message on the product label. We providing expert covering designs to enhance your product image on the shelf. We provided packaging designs for food products, electronic items etc..
Our team of experts creates a brand identity for corporate companies by offering a suite of corporate assurance including visiting card designs, logo design, letterhead designs, envelope designs, and Power Point template designs as per the brand identity. Before starting a brand, it is important to set the rules for all branding and messaging as per the guidelines. In future whenever a designer or Company is engaged, they could follow the guidelines to ensure consistency in the advertising. We Create A designs are unique and compelling designs for store interiors using state-of-the-art printing technologies to provide consistent and stunning visual appeal in in-store branding. Sieve Softech offers to brand for clients for events, exhibitions, road shows, and other activities. Also, we provide stunning creative for Hoardings, bus shelters, lollipops, central medians, etc. Sieve Softech designers who can give you the most unique, meaningful and inventive logo designs that will boost your brand from the ordinary. See few of our Logo Designs created by our Designers. We include the best practices in the UI/UX design and development services, that incorporate development activities at every stage of the life-cycle. Our team experts transform your business by offering comprehensive Mobile & Web Apps Development Services with required customization. Digital marketing is a Key marketing strategy for your business. We offering SEO, Google AdWords, SMM, and other relevant services.